"NY-19" redirects here. NY-19 may also refer to New York State Route 19. United States House of Representatives, New York District 19 is located in New York's Hudson Valley and Catskills regions. District 19 lies partially in the northernmost region of the New York metropolitan area and mostly south of Albany. It is currently represented by Democrat Antonio Delgado. 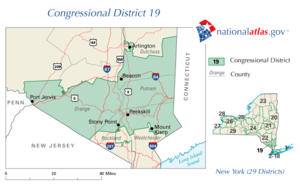 New York 's 19th congressional district, since January 3, 2013. After redistricting in 2012, the 19th district comprises all of Columbia, Delaware, Greene, Otsego, Schoharie, Sullivan, and Ulster counties, and parts of Broome, Dutchess, Montgomery, and Rensselaer counties. President Obama won the new district by 6.2% in 2012. The current 19th District is largely a merger between the former 20th and 22nd Congressional Districts. From 2003 to 2013, the 19th was composed of parts of Dutchess, Orange, Rockland, and Westchester Counties, in addition to the entirety of Putnam County. Much of this district is now the 18th District, while the current 19th is essentially the successor of the former 20th District. Sitting 19th district representative Nan Hayworth opted to follow most of her constituents into the new 18th, but was defeated by Democrat Sean Patrick Maloney, a former advisor to President Bill Clinton. Most of the old 19th district is now part of the 18th district. Meanwhile, sitting 20th district representative Chris Gibson ran for re-election in the new 19th and won. On January 5, 2015, per his pledge when first elected not to serve more than four terms, Gibson announced that he would not run for re-election in 2016. In 2016, Democrat Zephyr Teachout was defeated by Republican John Faso in the November 8 election. Faso was defeated after only one term by Delgado. Various New York districts have been numbered "19" over the years, including areas in New York City and various parts of upstate New York. The 19th District was a Manhattan-based district until 1980. It then was the Bronx-Westchester seat now numbered the 17th District. The present 19th District was the 21st District prior to the 1990s, and prior to that was the 25th District. March 3, 1877 Redistricted from the 18th district. March 3, 1893 Elected to finish Kane's term. January 3, 1945 Elected to fill the term when Representative-elect Samuel Marx died. December 30, 1945 Redistricted from the 12th district. Resigned to become justice of the New York Supreme Court. December 31, 1956 Elected to finish Dickstein's term. January 3, 1983 Redistricted from the 18th district. August 5, 1988 Redistricted from the 10th district. January 3, 1995 Redistricted from the 21st district. Redistricted to the 18th district and lost re-election. January 3, 2017 Redistricted from the 20th district and re-elected. Note that in New York State electoral politics there are numerous minor parties at various points on the political spectrum. Certain parties will endorse either the Republican or Democratic candidate for every office, hence the state electoral results contain both the party votes, and the final candidate votes (Listed as "Recap"). ^ Chris Gibson won't run for reelection, Politico, January 5, 2015. Retrieved March 29, 2016. ^ Niedzwiadek, Nick (November 9, 2016). "Faso defeats Teachout as Republicans hold NY House seats". Politico. Retrieved November 13, 2016. ^ Bloom was elected elected January 30, 1923 for the term beginning March 4, 1923. The Biographical Directory of the United States Congress incorrectly states the beginning of his term as his election date. ^ "NYS Board of Elections Rep. in Congress Election Returns Nov. 4, 2008" (PDF). Retrieved December 8, 2008. ^ "NYS Board of Elections Rep. in Congress Election Returns Nov. 2, 2010" (PDF). Retrieved December 8, 2008. ^ "NYS Board of Elections Rep. in Congress Election Returns Nov. 6, 2012" (PDF). Retrieved September 25, 2013. ^ "NYS Board of Elections Rep. in Congress Election Returns Nov. 4, 2014" (PDF). Retrieved March 19, 2018. ^ "NYS Board of Elections Rep. in Congress Election Returns Nov. 8, 2016" (PDF). Retrieved March 19, 2018.